There is a field of research called Natural language processing (NLP) which is a subfield of computer science, information engineering, and artificial intelligence that is concerned with the human-machine interface via languages. In particular, how computers process and analyze large amounts of natural language data. Natural Language processing is the use of machine learning to discover insights and relationships within text. Manually processing large numbers of text requires time and effort to compare the text especially text from large documents, or voice of the customer. Computers offer the ability for real time voice to text conversion and analysis. The challenges involved in natural language processing involve speech recognition, language understanding, and also language generation in the sense of artificial intelligence programs responding to live human customers. The program that analyzes the text looks at a semantic search, text categorizations, and other text related comparisons. Companies are also developing API’s (Application programing interfaces, i.e. making function calls within the software to text processing code developed by others) to allow for making text based analysis much easier for software development. API driven software can automatically analyze written text, compare text against each other for similarity relatedness or to compare texts to examples for more efficient categorization. Natural language processing covers the categories of textual analysis, Grammar induction, Semantics, and Discourse (synthesized speech). 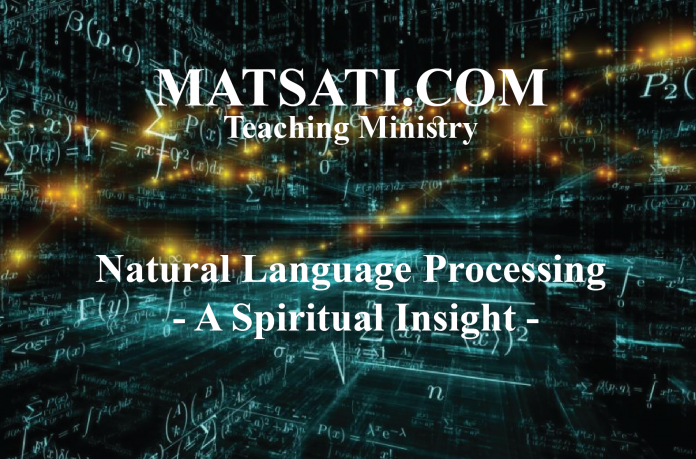 The Spiritual application that we obtain from this topic on Natural Language Processing I feel is related to the topic of “studying the Bible in a vacuum.” When studying the Holy Scriptures, one must take a multi-disciplined approach. Just as we see the NT does not stand on its own but is founded upon the Hebrew Scriptures (Tanach: Torah, Neviim, Ketuvim), so too the teachings that we find in the NT are rich in the rabbinic mindset. For example, most Christians in our Western Society are somewhat familiar with the NT teachings, especially the moral and ethical teachings of Yeshua, and those of his disciples. The Sermon on the Mount (Matthew 5-7, Luke 6) and turning the other cheek (Matthew 5:39, Luke 6:29), etc. Major themes from a rabbinic Jewish conceptual framework flow from the moral teachings of Yeshua in the sermon on the mount. For example, the Jewish Kal Vachomer is a rabbinic teaching style that Yeshua utilized quite often, which may be found in places such as Matthew 5:21-22 and 5:27-28. In Matthew 5:21-22, Yeshua says that any man who is angry with his brother is a murderer and in danger of being cast into hell. On the one hand, murder is very “heavy” and the penalty is death, whereas if someone thinks in their heart of murder or killing someone but does not act upon it is not judged. No man knows the thoughts of another man, so thoughts of murder are lenient until acted upon which would become heavy. Yeshua raised the bar saying that if a man thinks in his heart murderous thoughts he is guilty and in danger of hell. In fact, if a man hates his brother he is in danger due to the sin of murder and in danger of hell. In a similar way, in Matthew 5:27-28, Yeshua said that any man who looks upon a woman and lusts for her has already committed adultery and is guilty. Similarly, the act of adultery is “heavy” and the penalty is death, whereas our thoughts are considered light, even today we are very lenient on the way we think, the thoughts of our minds as compared to our actions. This is closely related to our relationship with others and with God, especially with regard to our hearts, the very thing that we judge leniently upon (the thoughts of our hearts) is the very dwelling place of God’s Holy Spirit. Taking the perspective that Yeshua sends the Holy Spirit to dwell within our hearts, within our bodies, how “heavy” does what Yeshua is saying become if we have murder or lust in our hearts regardless of whether we act upon them physically? The original context of the sermon on the mount was not at the pulpit of the Christian church on Sunday, but rather within the setting of Jewish learning and education in the land of Israel in the first century! What this reveals to us is how the root system on the foundation of Scripture is much more extensive than we have been taught. Yeshua taught on themes such as fasting, prayer, and charity (see Matthew 6:1-18, Luke 11:2-13). In the first century, the people who had first hand teaching from Yeshua himself understood that these activities were expressions of their spirituality. The point of these things is to understand that we need to develop a love for the life of the people of Israel from the first century who studied Torah and practiced it by reaching out to others. When we study the rabbis from this perspective, we learn to understand rabbinic thought and literature at a much greater level. The Jewish literature contains many commentaries on the Bible and provide instructions on how to live a life that is pleasing to God within a community of believers. Take for example, the rabbis never tire of acclaiming the power of repentance. He used to say: more precious is one hour in repentance and good deeds in this world, than all the life of the world to come; And more precious is one hour of the tranquility of the world to come, than all the life of this world. בן עזאי אומר, תדע לך כח התשובה, בא וראה מר’ שמעון בן לקיש שהיה הוא ושני ריעיו בהרים גוזלין וחומסין כל אשר יעבור עליהם בדרך מה עשה ר’ שמעון הניח לשני ריעיו שודדין בהרים ושב לאלהי אבותיו בכל לבו בצום ובתפלה והיה משכים ומעריב לבית הכנסת לפני הב”ה והיה עוסק בתורה כל ימיו ובמתנות עניים ולא שב על מעשיו הרעים עוד ונתרצית תשובתו וביום שמת מתו שני רעיו השודדים בהרים ונתנו לר’ שמעון באוצר החיים ולשני רעיו בשאול התחתונה. Ben ‘Azzai said: Know thou the power of repentance. Come and see from (the story of) Rabbi Simeon, son of Laḳish. He with two || of his friends in the mountains, were robbing all who passed them on the way. What did he do? He forsook his two companions who were plundering on the mountains, and he returned to the God of his fathers with all his heart. Fasting and praying he arose early and retired late, before the Holy One, blessed be He, and he was studying the Torah all (the rest of) his days, and (giving) gifts to the needy. He did not return any more to his evil deeds, and his repentance was accepted. On the day when he died, his two companions, who were plundering on the mountains, also died. And they gave a portion in the treasury of the living to Rabbi Simeon, son of Laḳish, but his two companions (were put) in the lowest Sheol. ואמרו שני רעיו לפני הב”ה, רבון כל העולמים יש לפניך משוא פנים, זה היה עמנו שודד בהרים והוא באוצר החיים ואנו בשאול תחתית אמ’ להם זה עשה תשובה בחייו ואתם לא עשיתם תשובה הנח לנו ואנו עושים תשובה גדולה אמר להם אין תשובה אלא עד יום המיתה. The two companions spake before the Holy One, blessed be He: Sovereign of all the universe ! There is before Thee respect for certain persons. This one was plundering with us on the mountains, and he is in the treasury of the living, whilst the other men are in the lowest Sheol. He said to them: This one repented in his lifetime, but ye have not repented. They said to Him: Give us the opportunity, and we will repent very sincerely. He said to them: Repentance is only possible until one’s death. A more accurate understanding of Jewish teachings from the ancient rabbis brings the message of the Gospel alive. We can see here from the Mishnah and the commentary on the importance of repentance. The book of Jonah (3:5) reveals the connection between fasting and repentance. Through fasting the people repented of their sins and the judgment of God was turned from them. It was through fasting and affliction that God was pleased because this produced humility in the people which in the end changed their conduct (Jonah 3:10, see also Isaiah 58). Just as we see in the research on Natural Language Processing, the computers ability to recognize natural language is very difficult which has made this a very broad field of research. Similarly, we must also take this approach (multi-disciplinary) in biblical studies and not forsake the ancient rabbis concerning the parallels we find in the Scriptures. What we have to do is overcome our misconceptions of the rabbinic literature, as most who have not studied the rabbinic literature knows next to nothing except for the antisemitic sentiments made by uninformed scholars. Overcoming prejudice based upon misconception is a formidable task. We have to recognize first that some earlier teachings on Judaism and the Jewish people are not always accurate. A more accurate understanding of Jewish teachings will help to understand the first century background and develop a much different view of the Scriptures, including the Pharisees of whom Yeshua was a part of (Luke 5:30). Our study of the rabbinic literature does not change the NT conclusion of Yeshua as the Messiah of God who laid his life down for ours, rather, it support this interpretation and more! The rabbinic literature in many ways teach a heartfelt repentance between God and the individual. This is a major theme that we find throughout the Apostolic Writings (NT). By comparing the teachings of Yeshua with the common themes in the rabbinic literature we can gain a fresh insight into the deeper meaning of the Jewish conceptual world and environment that speak of loving God and of having compassion for others. The idea of having compassion for others is a huge failing in the Church today. Some might disagree, but look at the interpersonal relationships within the Church today. Most all people come and go on one day a week and have zero involvement with others. This is a significant failing! Studying the Scriptures coupled with the rabbis in this way reveals to us how important these things are but yet this is ignored today! If we don’t care and are uninvolved with others, is this the kind of description we get from the Bible pertaining to the life of the “people of the book” (believers)?